Broad Beans would be so tiresome if they were in season all year round. Removing the pods, cooking, skinning. It’s a fair bit of work. Something I’m more than happy to do in spring when they’re in season to experience their fleeting deliciousness. Joy of joy, despite my poor broad bean plants this year (almost certainly a seed quality issue, I’ve discarded the rest and will get new ones for next spring), tonight’s meal was a mixture of home grown and market broad beans. The spring onions and basil were from my garden too. Preheat oven to 180 degrees. Rub potatoes with oil, prick with a fork and bake until tender. Pan fry bacon until crispy and cut into small pieces. Place 1 litre of water in TM bowl and place broad beans in steamer basket. Cook at 100 degrees for 8 minutes on speed 4. Or boil water in a small saucepan and simmer for 5 minutes. Remove beans, empty bowl. Let beans cool slightly and remove outer skins. Add all other ingredients except feta and bacon to TM bowl and blend for 8 – 10 seconds on speed 4. Or use a food processor. Ingredients should still be nice and chunky and well blended. Add bacon to thermomix and blend or 5 seconds on speed 3. Or just stir in until well combined. 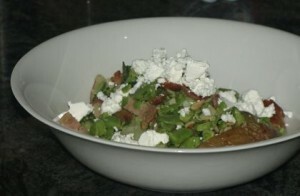 Cut potatoes open, stuff with broad bean mixture and top with crumbled feta. There is just enough leftover broad bean mixture for my lunch tomorrow. I’ll toast some sourdough, rub it with a cut garlic clove, pile the broad bean mixture on top and sprinkle some more feta over that. Yum. Oh! Dani! Look over there! *sneaks off with dish whilst Dani is looking the other way*. I’m guarding those leftovers with my life Docwitch!